Notice our brightly coloured headwear on the back wall; it really draws you in doesn’t it? 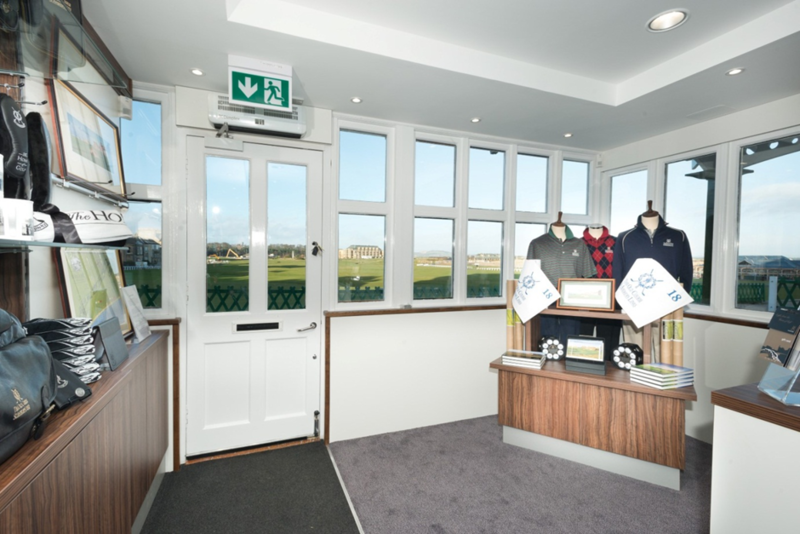 The St Andrews Links Golf Shop that looks onto the 18th Green of the Old Course recently underwent a complete refit and we are delighted with the results. 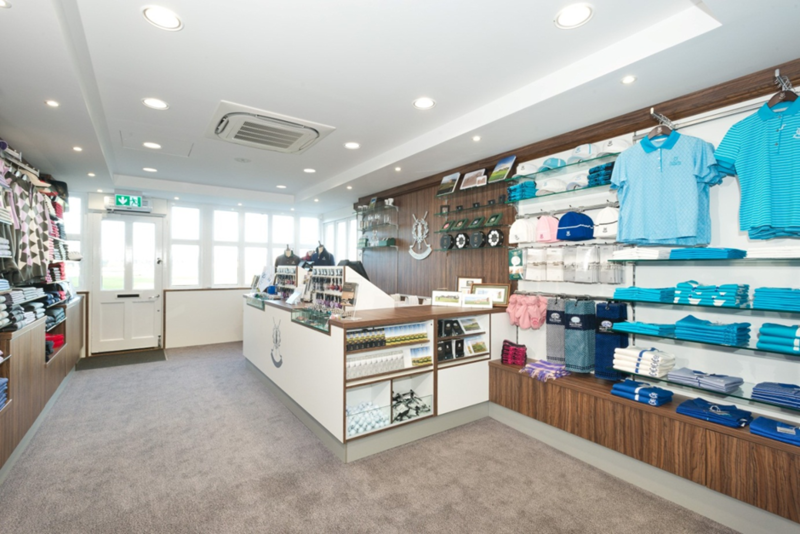 St Andrews Links took complete control of the shop in 1999 and it has been selling official St Andrews Links Merchandise to visitors and locals alike for many years. A refresh, however, was well needed and in February work began to rip out the old shop fit leaving just the outer shell of the building. The photo below was taken years before the renovation and shows the old setup with the tartan carpet, lightwood shelving and the counter positioned at the front door. 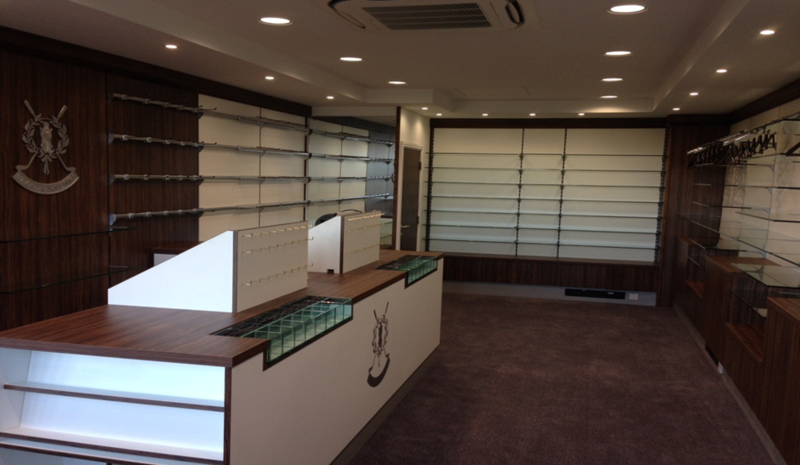 The refit aimed to make better use of the floorspace by resituating the counter and fitting rooms. Walls were also built around the windows so that the natural light would flood into the front of the shop only. The work took place in the low season during which the shop remains closed. 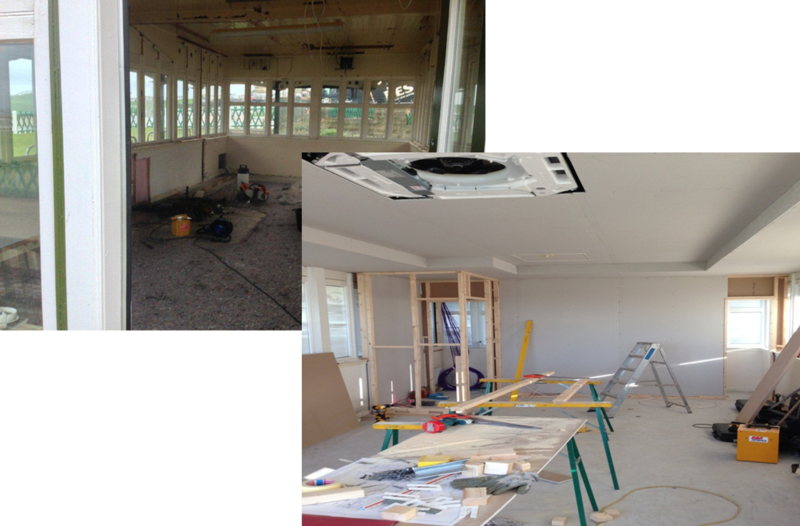 Below you can see the shop after the old shop fit had been ripped out and early stages of the new one being installed. After a few weeks we saw the new refit really taking shape and below you see the finished article before we had merchandised it. It looks clean, fresh and ready to be stocked up with the bright and colourful ranges we purposely bought for it. And here it is! 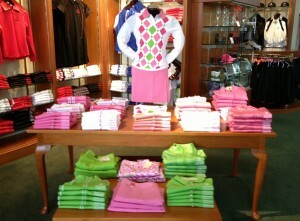 The new 18th Shop fully merchandised and looking amazing. Notice our brightly coloured headwear on the back wall; it really draws you in doesn’t it? Also, look how big the shop looks compared to the early photos. 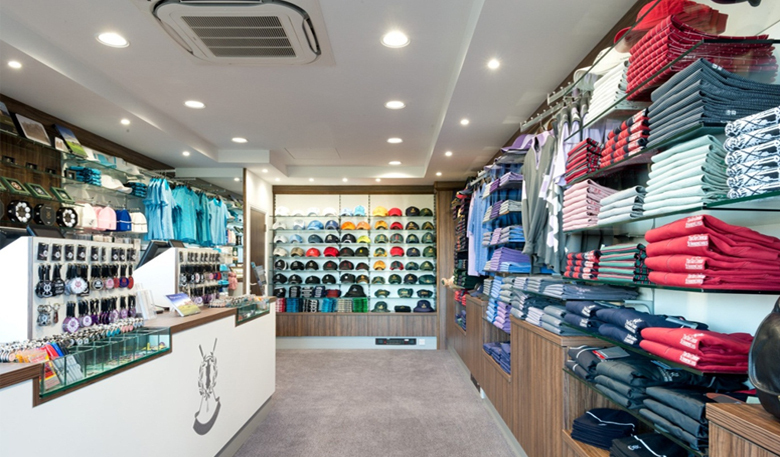 The garments and accessories chosen for this shop compliment the new interior. Once the customer is ready to pay, it’s easy for them to see any little extras that they would like to purchase from our new counter that’s home to all manner of accessories. 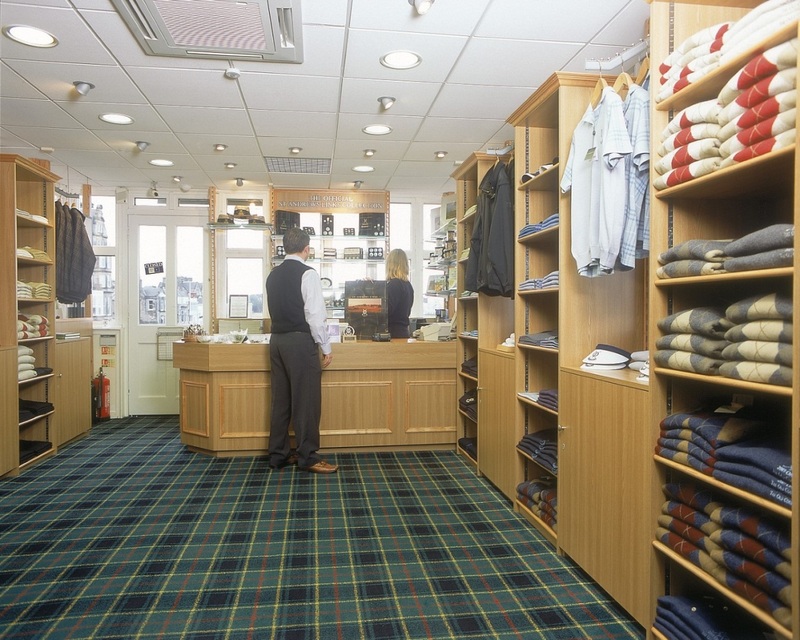 From hat clips to divot tools, we have an extensive selection on offer! There’s a wealth of space behind the counter for our giftware and prints range, as well as devoting one corner of the shop to our ‘feature’ range. This can be curated and tailored to special offers or ranges that will change throughout the year. 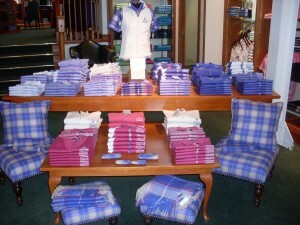 At the moment, for example, we have some Bobby Jones product on show, but in the very near future our 2015 Open Championship host venue products will be on display in an explosion of red, white and blue. You’ll also see the outside of the building has had a bit of a makeover too. 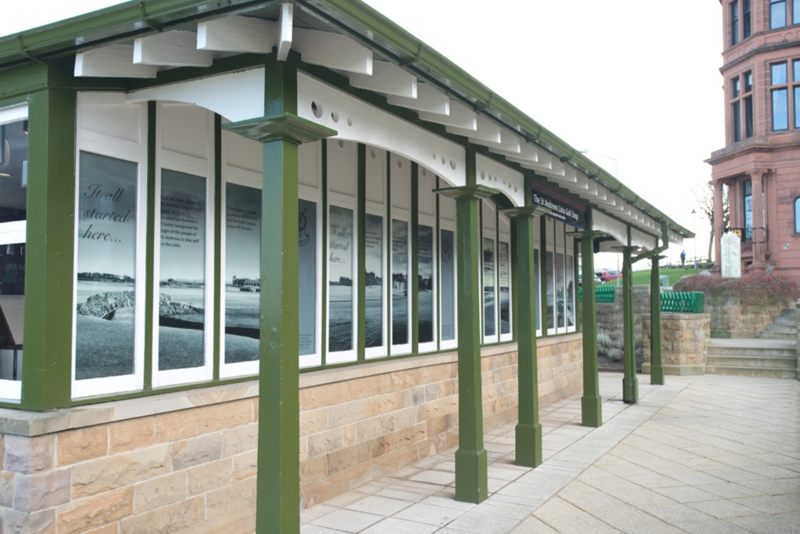 Two sides of the shop have had special manifestations fitted to the windows with each telling the story of the Home of Golf through a series of fun facts. We look forward to welcoming customers to our new 18th Shop and if you’re visiting St Andrews, pop in and see for yourself!